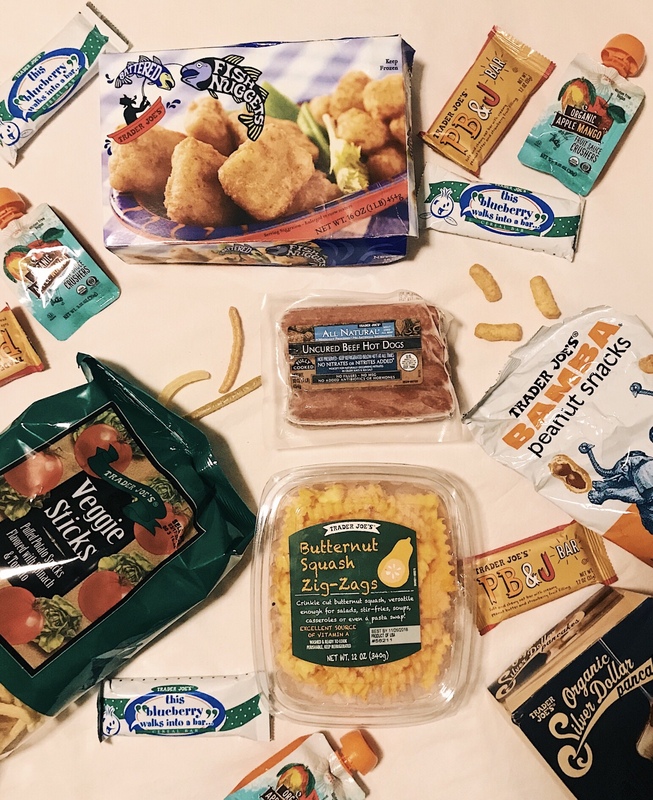 I thought I would take a break from all of the festive holiday posting, and share some Trader Joe’s kids favorites that your babes will go crazy for. Beckett is 1.5 so as most of you mammas know they are PICKY little guys. Trying to get him to eat a vegetable is like trying to get me to stop eating carbs, impossible. Trader Joe’s is probably my favorite places to shop for Beckett. They make everything quick, easy, and healthy which is exactly what this working mamma needs. I have definitely nailed down his favorites that are my go to every time we go shopping. 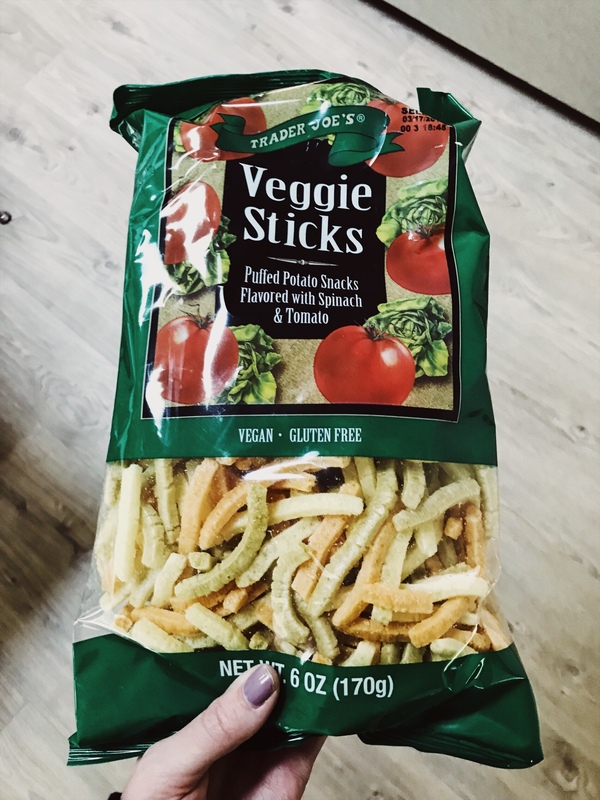 Veggie Sticks: These can be found in the chip isle. Beck goes nuts for these things. I love them because they are Vegan and Gluten Free. I always pack these when we are on the go in the diaper bag or for a quick daycare snack. You cant go wrong with these. 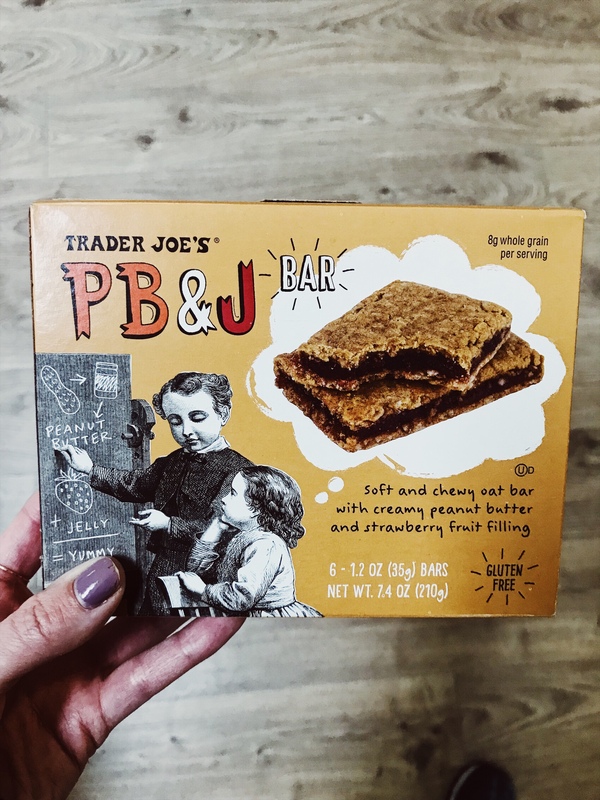 PB&J Bar: These can be found right across from the fruit section with the granola bars at the beginning of the store. Beck loves these granola bars. They taste exactly like a peanut butter and jelly sandwich, without the mess. These are also gluten free. The only issue with these is you have to be careful eating these around other kids because of possible peanut allergies. 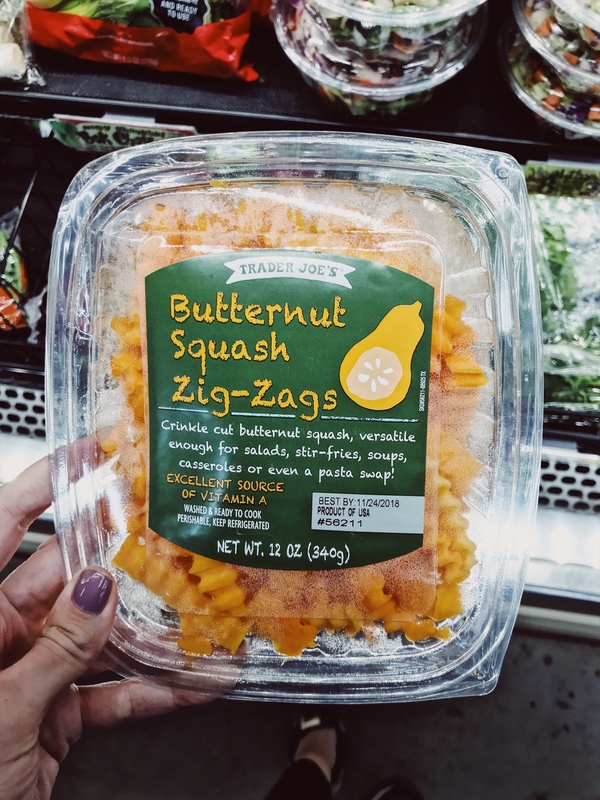 Butternut Squash Zig Zags: These can be found in the prepared food area where the chopped/bagged vegetables are. These are quick and easy to cook for your little one. They are washed and ready to go. They cook in the microwave in under 4 minutes. I love to add marinara and parmesan with them for Beckett and act like they are pasta. I love all of TJ’S ready to go food. 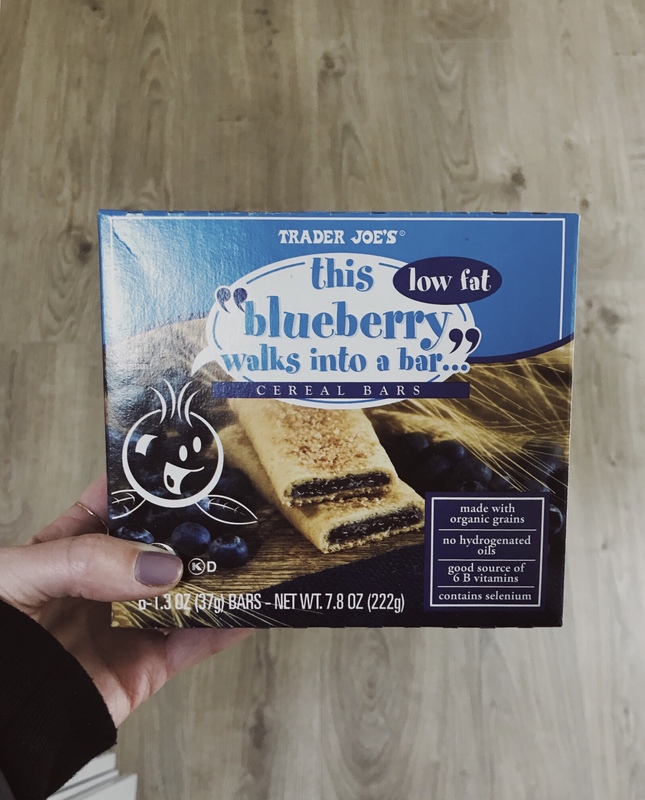 This “blueberry walks into a bar” Cereal Bar: These can be found right across from the fruit section with the granola bars at the beginning of the store. These can be a little messy but Beckett loves them. They are great for a quick breakfast or to throw in the diaper bag for an on the go snack. They have better ingredients in them then most cereal bars. They also come in other flavors but our favorite is blueberry. 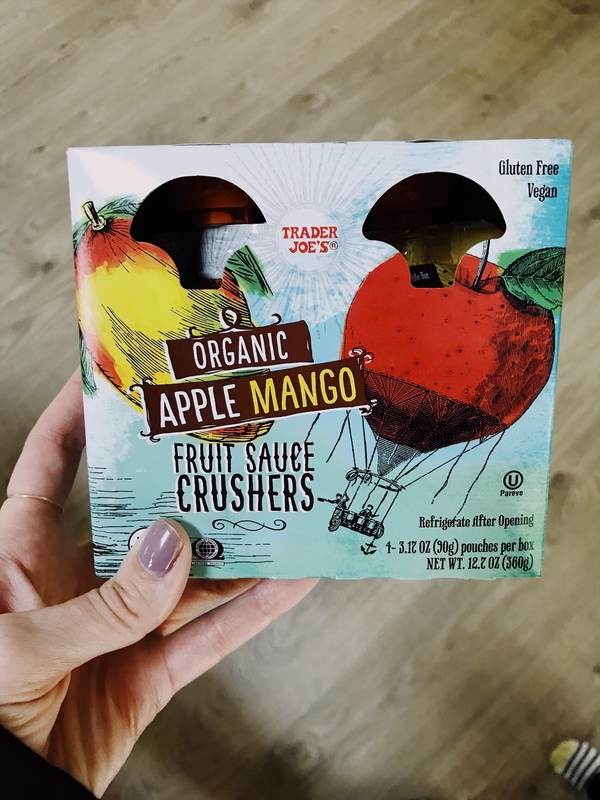 Organic Apple Mango Fruit Sauce Crushers: Located in the dry goods isle. These are probably my favorite on this list. They are my favorite because of the size of them. Beckett rarely finishes an entire pouch so the mini size of these is perfect for him. I cant even count the number of pouches I have thrown out because they weren’t finished. I don’t think we have ever thrown one of these out because they are the perfect serving size at 3.17 oz for him. They do have regular size pouches as well but we love these. 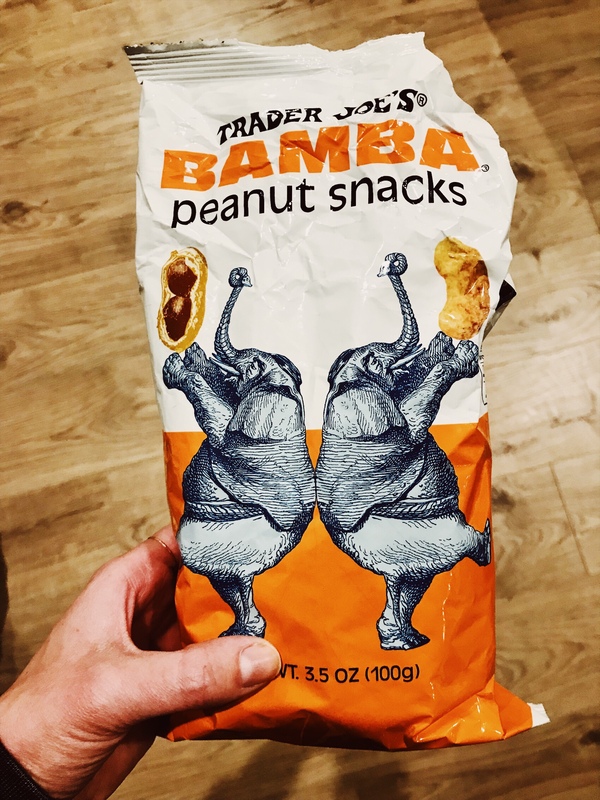 Bamba Peanut Snacks: Located in the chip isle. These are so delicious even I eat them. They are basically a peanut flavored Cheeto puff. Our doctor recommended these to us to give to Beckett early on so that he was introduced to peanuts right away. Beckett has been hooked ever since. Also a great snack to take on the go. We cannot keep enough of these stocked in our house. 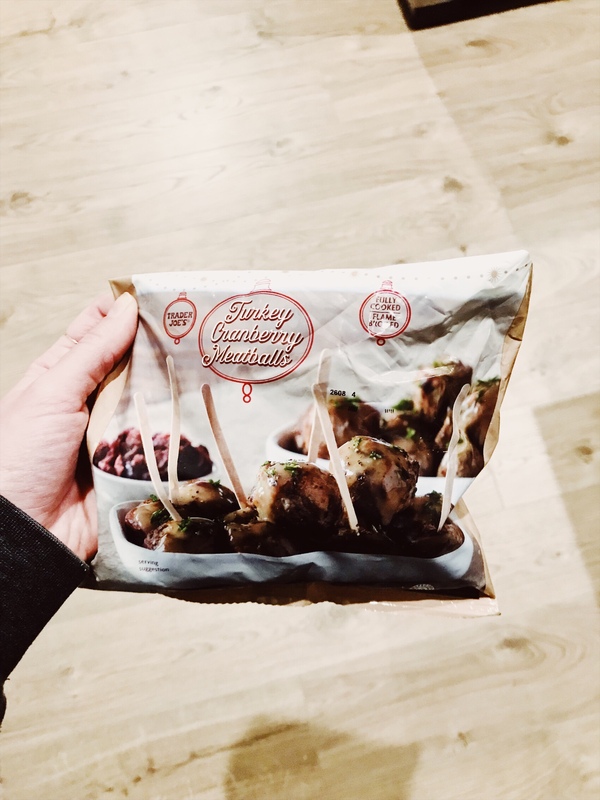 Turkey Meatballs: These are located in the frozen food section. They have a great selection of already cooked, frozen meatballs. We are currently loving the seasonal cranberry meatballs pictured here however these may be gone soon. We do love the regular turkey meatballs as well. They are great with marinara and are ready in 3 short minutes. 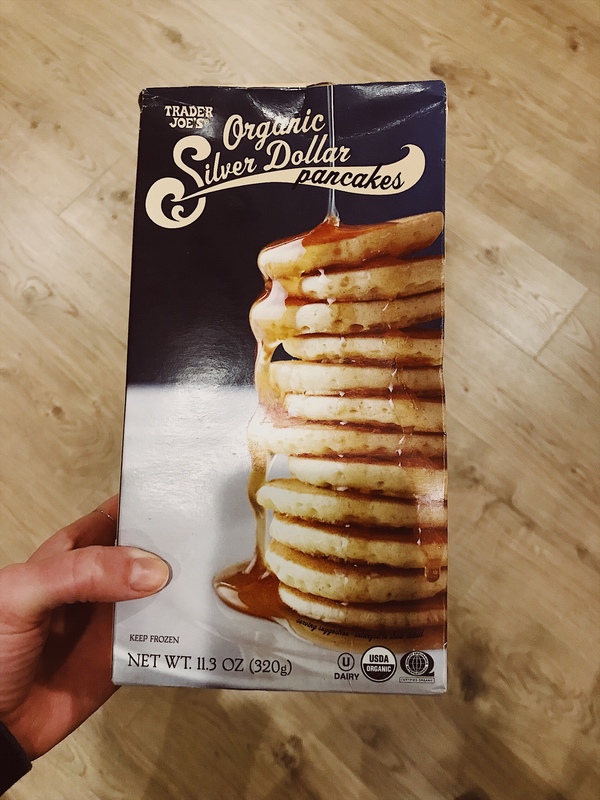 Organic Silver Dollar Pancakes: These are located in the frozen food isle. They are so good and just the right size for kids. I just pop them in toaster in morning and we are ready to head out the door. Beckett loves these with jelly or peanut butter on them. We love the size of them so you can easily make for a quick snack. These are a must have in our house. 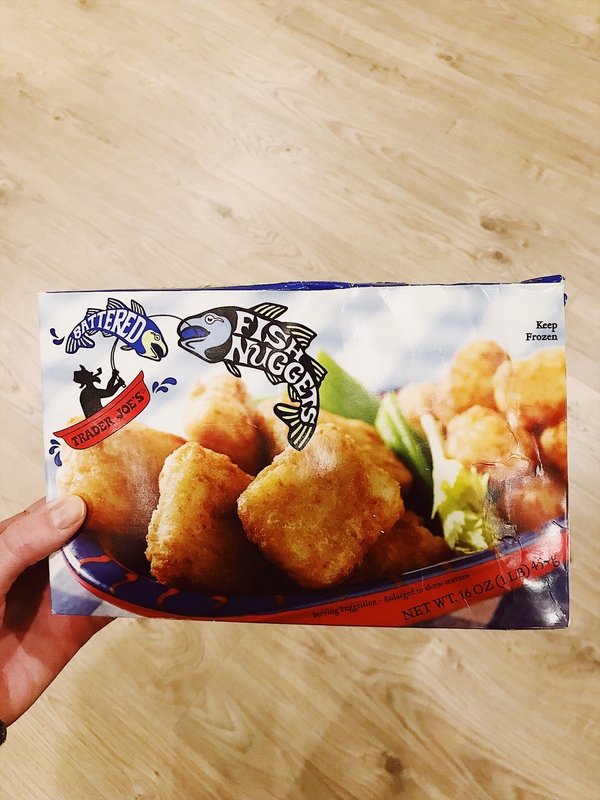 Battered Fish Nuggets: These are located in the frozen food isle. Beckett will eat four or five of these in one sitting. The only downsize is they do take awhile to cook so just plan ahead for the 10-15 min cook time. He enjoys them with ketchup but will gobble them up plain as well. 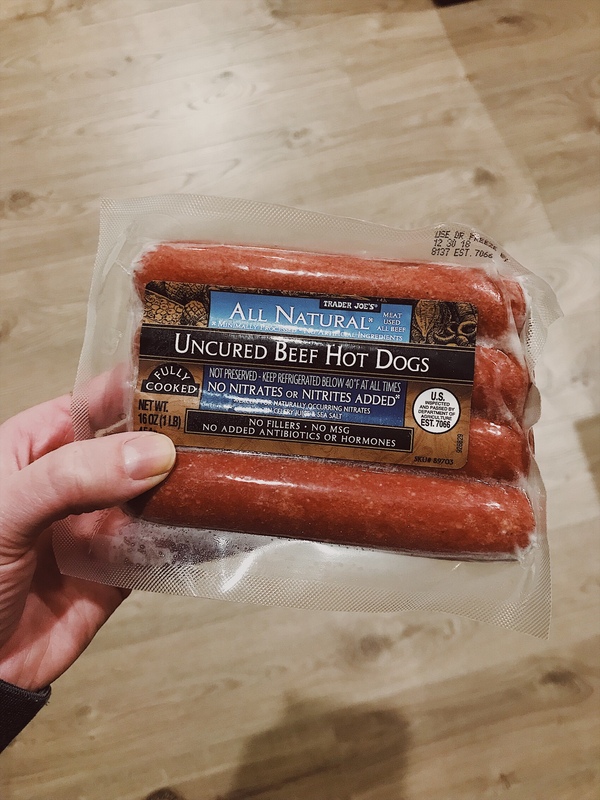 We have tried a few other brands and we just keep coming back to these because of the small size of them and they have a shorter cook time than most others we have tried. I hope you guys will go give these items a try. Please report back and let me know what your kiddos are loving. Also please share with me what some of your favorite Trader Joe’s items are for your kids. I am sure there is still lots to discover and I love trying out new items. I love how they are always re inventing themselves with new items. It keeps grocery shopping a little bit more exciting.